The name rings out like a clean piano chord, through the heavy air of a smoky room. 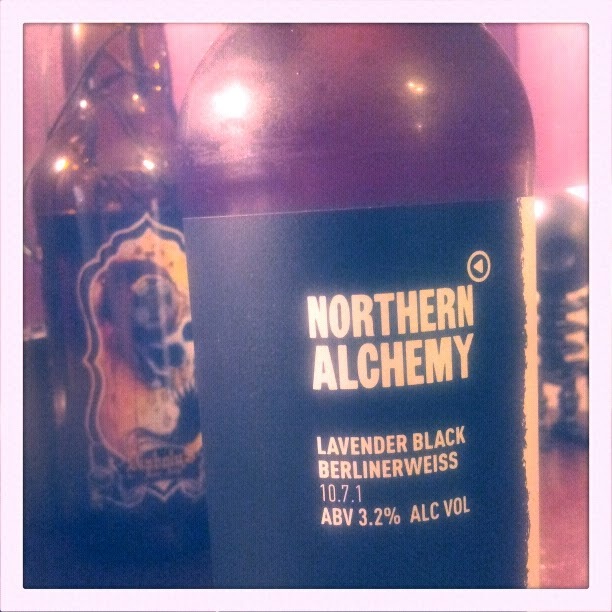 A few years of the Northern Alchemy team naming their beers simply and efficiently, giving them monickers that tell the prospective drinker what they're buying into with minimal fuss, has given us Lavender Black Berlinerweiss. Functionality and simplicity has somehow generated the most perfect name for an Anglo-German, jazz singing, Weimar-era thriller protagonist. 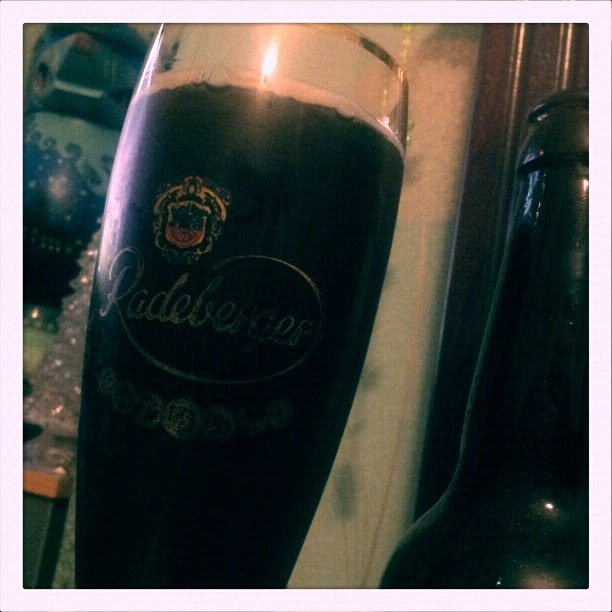 A dark beer, in the Berliner Weisse style. Made with lavender. I pour her into a fine pilsner class, thin and elegant, the sharp citrus of her neck-scent still echoing through my skull. The glass fills with beer the colour of melted milk chocolate, seeming to lighten towards almost-transparent caramel at the bottom of the glass. The first mouthful is the sourest of lemon, the bitter and tart Berlin style slashing and smiting like a citric sabre, leaving juice-drenched rite-of-passage scars on the palate. Landing blow after blow through a fog of imposing lavender aroma. A few more mouthfuls into this elegant beating and the lavender on the taste rises, eventually overpowering the lemony flavour, as the brain makes peace with processing the taste of bitter, sour, liquid lavender; a taste which conceals beneath its floral jacket slender slivers of celery. The carbonation is strong, making the experience of drinking Lavender Black Berlinerweiss even more pointed; bubbles burst jaggedly on the tongue, cracking on the roof of the mouth. The beer's time on the structures of the mouth is limited- this black Weiss doesn't stick to the insides of the eating-equipment. There is very little cloy, no real sugary glom on the membranes. An easy, crisp and clean drink that challenges the taste sensors and leaves between mouthfuls only a musky aftertaste of lavender. At 3.2% abv there is no head-burn, the skull remaining at a Berlin level of cool. The final mouthful is a mouth-pinching pucker of lemon and sour herbs, a taste of greenhouse dankness looming in noir-ish shadows as Lavender Black Berlinerweisse steps back from the microphone and into darkness. "Encore" I say, to nobody in particular, as I crack open another bottle. Not a dry mouth in the house.